A couple of weeks ago, we released a chart estimating maximum contribution credits for Cash Balance Plans at different ages and compensations. 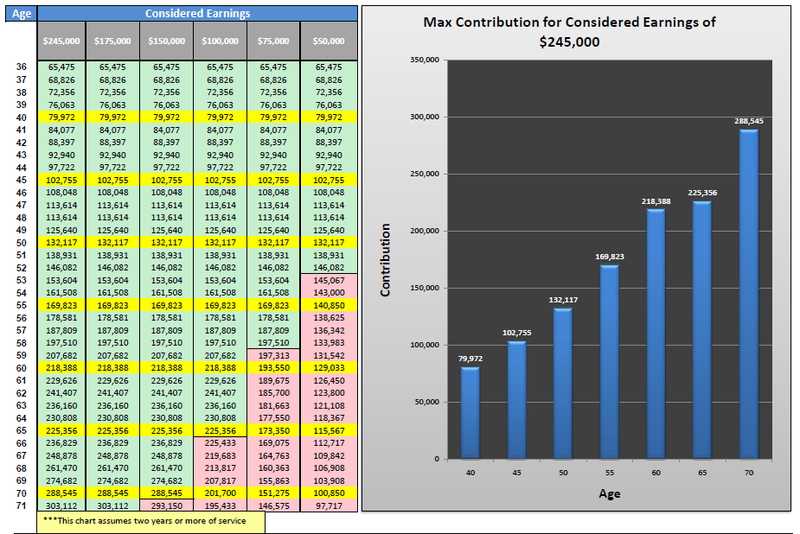 For example, the chart shows that a 55-year-old has a 415 Lump sum limit of $169,823 whether he makes a compensation of $75,000 or $245,000. Assuming an interest credit of 5% per year, will he exceed his 415 limit and be forced to stop or reduce his contribution credit at some point in the future? The following chart summarizes the projection analysis of cash balance maximum contributions for varying ages, past services, and compensations. It is designed to give you an idea of how much and how long maximum contributions could be made in a cash balance plan. It demonstrates that participants may only be able to make maximum contributions up to a certain point. 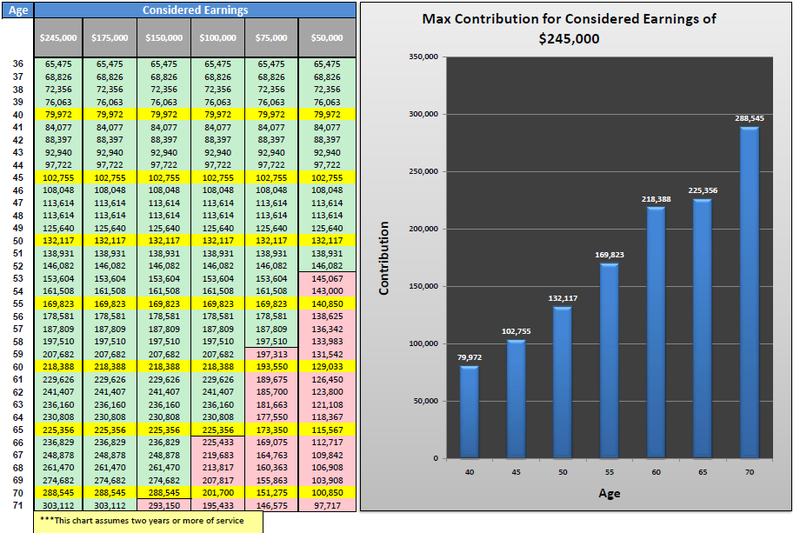 How to use the chart: For example, an owner at age 50 with 5 years of past service and compensation of $245,000 at plan inception (ages are at plan year-end). 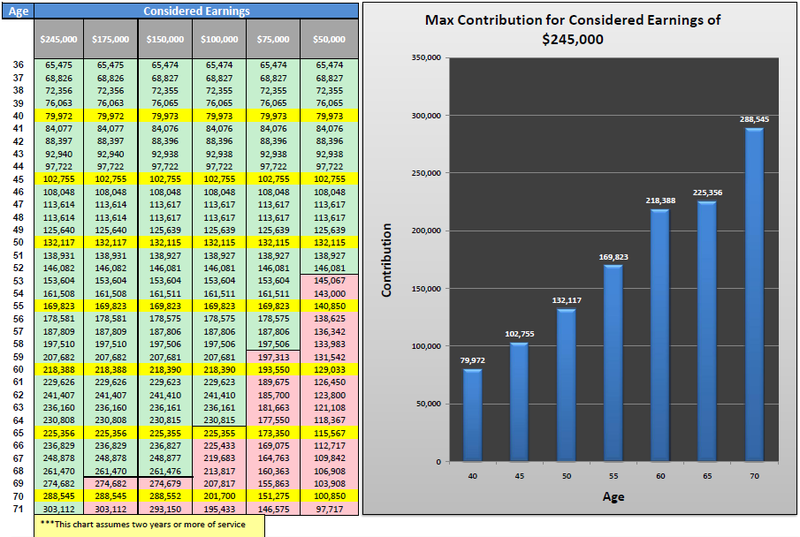 Note: There are two maximum contributions shown in the age 60 & 65 sections. 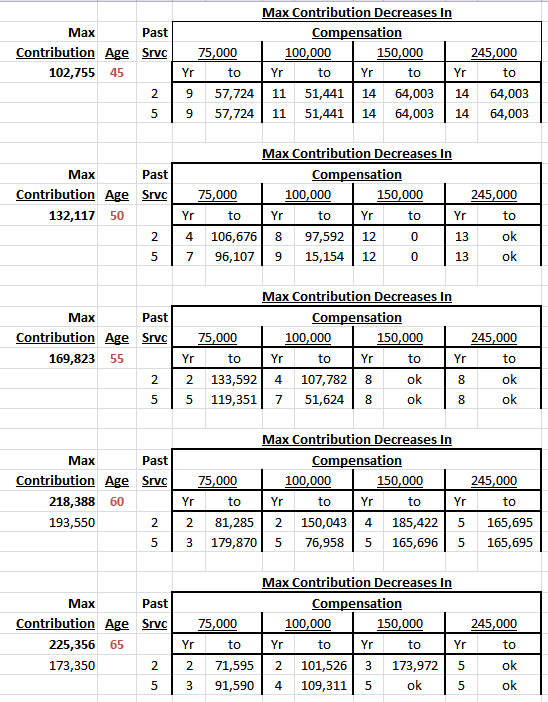 The lower amounts are the maximum contributions when Past Service = 2 yrs. and compensation is $75,000. Now, let’s take an employee who is 55 years old with two years of service, and a compensation of $75,000. Currently, the participant’s 415 Limit is $169,823. At first glance the participant thinks he will be able to make a the maximum contribution of $169,823 per year until retirement…sounds good right? However, the contributions are misleading. The participant will only be able to make the max contribution for the first year of participation, at which point the contribution levels will decrease. The participant will be able to make the max contribution for the first year of participation, at which point the contribution levels will decrease slightly, and then return to the $169,823 level. So why are the contributions decreasing? The contributions are decreasing because the 415 Limit considers the lesser of the dollar limit (195,000 actuarially reduced to attained age) and the compensation limit. The Dollar limit is accrued at 10% per year of participation. The Compensation limit is accrued at 10% per year of service. In this example, in the first year the Dollar limit is $1,005 per month and the Compensation limit is $1,250. The 415 limit is $1,005 and when converted to a lump sum is $169,823. In the 2nd year, the compensation limit is now lower than the dollar limit and the 415 maximum lump sum goes down. In general, we only need to realize that in recommending the maximum 415 lump sum contribution, the danger on exceeding the 415 in later years will most likely occur when the principal is making less than $100,000 and/or only has 2 years of past service at plan inception.